Characteristics of a Sustainable Project Manager (1 of 9) "Benefits Focused"
There are a countless number of blog posts, books, articles, and papers on project competence or the application of knowledge, skills, and abilities in order to achieve the desired results (See the IPMA ICB 4.0) and even more materials on the knowledge of technical practices that a project manager should possess. There isn’t much discussion however on individual characteristics or traits. Generosity is his chief characteristic. In putting together these nine characteristics for the book, we used: “pertaining to, constituting, or indicating the character or peculiar quality of a person” from the context of a project manager and taking into account the accepted competencies and expected knowledge that one should possess. A sustainable project manager is an individual who manages a project by employing a collection of diverse but integrated competencies to deliver on the objectives detailed in the business case and tailoring the appropriate methods, tools, and techniques for leading the project team, engaging stakeholders, and progressing the project while still safeguarding society, the environment, and human rights. Sustainable project managers contribute to organizational goals while navigating complex cultures and dynamics to create benefits that support short- and long-term business strategies while simultaneously addressing our planetary constraints. As such, sustainable project managers have an important role to empower and indeed play as advocates, advisors, and architects of a better world. To be a successful sustainable project manager requires characteristics and this series will go in depth what our new book “Sustainable Project Management” touches on for each of the nine characteristics. There is a difference between project success and project management success. A project can fail but still be managed successfully and vice versa. 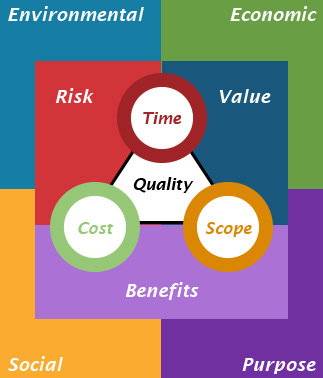 A simple way of putting it is that traditionally, “good” project managers are those who can deliver intended results while staying on budget, on time, and within scope. For Sustainable Project Management success, the project manager moves beyond compliance towards value creation as outlined in the figure below, which can be found in our new book. This brings us to our first characteristic which bears the same name as one of the elements in the figure, benefits. What this is: Focused on the business benefit that the project will produce and managing to that expectation. What it is not: Managing to a scope with tunnel vision and exclusively producing an output. Imagine a project manager on a construction site of a 15 story building who has a very detailed set of requirements, and is 60% complete with the physical structure when he/she reads an article about a similar building that utilized a new type of energy system that would save reduce energy costs almost 40% over the life of the structure but would require an additional $million dollars and could delay the project by three months.